It is sometimes described as a vegetable co-op, a weekly box delivery, a vegetable of the week club, or a produce subscription program, but we refer to it as Community Supported Agriculture, CSA.Families or individuals join our farm to receive weekly or bi-weekly deliveries of the fantastic organic produce we grow here at Harmony Valley Farm. Whatever is ripe and delicious for the week, goes into the box: washed, chilled and carefully packed. Then we deliver it to a neighborhood near you, if you live in or near Madison, Mazomanie,Viroqua and Onalaska or La Crosse, Wisconsin or The Twin Cities .The variety and quality – ask our members – is unmatched! We support the community with great, organic food and the community supports us! Community-supported agriculture (in Canada Community Shared Agriculture) (CSA) is a socio-economic model of agriculture and food distribution. A CSA consists of a community of individuals who pledge support to a farm operation where the growers and consumers share the risks and benefits of food production. CSAs usually consist of a system of weekly delivery or pick-up of vegetables and fruit in a vegetable box scheme, sometimes including dairy products and meat. We made it through a majority of last week’s vegetables. We were talking about this the other day and realized that for most of the vegetables we don’t experience their uniqueness. Often we through a bunch of greens into a salad or some other dish that utilizes a bunch. Last week I made a rice dish that utilized almost every vegetable that we got. I got the idea in part from the weekly newsletter (pdf) and their featured recipe a veggie stir-fry. It was delicious. The Amaranth changed the color of the rice to a slight purple. In the rice you could taste some of the different flavors. This is not a complete waste of veggies, but is something we are thinking about. If we were able to have lots of time and eat every meal at home we could probably do the shares their full justice. Sadly, this isn’t the case. We enjoy every bite of fresh veggie goodness. Week 7 of our CSA from Harmony Valley Farm (blog). Lots of delicious vegetables again and some sweet strawberries!! Pretty exciting to taste the strawberries as we’ll be picking a lot for ourselves this weekend at the Strawberry Picking Day!!! We ate a lot of today’s and last week’s veggies on a huge salad and then ate more on top of a pizza. Salad is an obvious way to include some of the “unknown” items into our diet. Below is a picture of the salad. 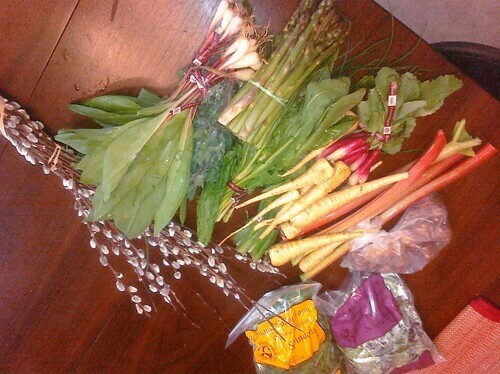 We received our first CSA today from Harmony Valley Farms. We are splitting it with our good friends – the Deckers. So this (and most pictures) will be from our half of the share. A CSA consists of a community of individuals who pledge support to a farm operation so that the farmland becomes the community’s farm, with the growers and consumers providing mutual support and sharing the risks and benefits of food production. CSA’s focus is usually on a system of weekly delivery or pick-up of vegetables and fruit, sometimes dairy products and meat. We are excited to see what else comes and to learn some new recipes! Adventures and Thoughts of Team Cross is powered by	WordPress 4.3.19 and delivered to you in 0.393 seconds using 36 queries.